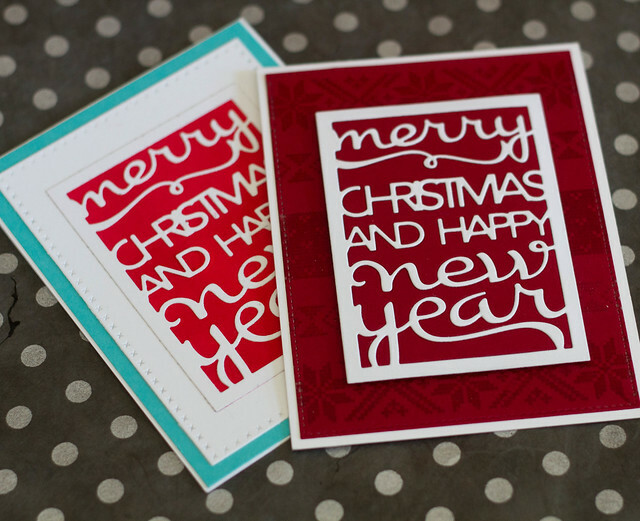 Today I have a couple of cards to share using the Christmas text-block die from Papertrey Ink, as well as the Fair Isle Borders stamp set, also from Papertrey Ink. I think this card may be my favorite of all the Christmas cards I’ve done so far. It was very simple to make, and it has an elegant feel to it. Also, as a knitter, how could I not love those fair isle borders? 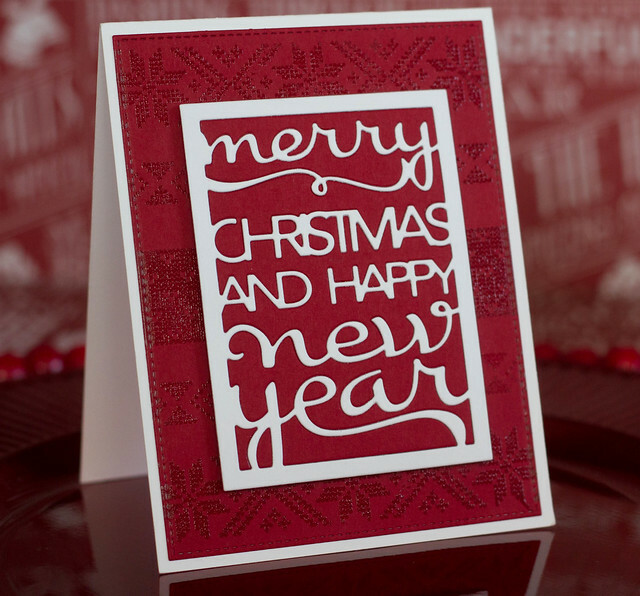 To make this card, I sandwiched two pieces of a lighter-weight card stock (from Paper Source) – white and that deep red (love that red!) die cut the text block. What this ended up doing was cutting through the top layer and not quite through the bottom layer. But it was a cool effect and it kept me from having to fiddle with layering and piecing them “just so” AFTER cutting. I set that aside and, using my MISTI, lined up three rows of the fair isle border stamps. Marking the position of my card stock on the grid paper for later, I stamped using VersaMark and heat embossed with clear embossing powder to achieve a tone-on-tone or watermark look. 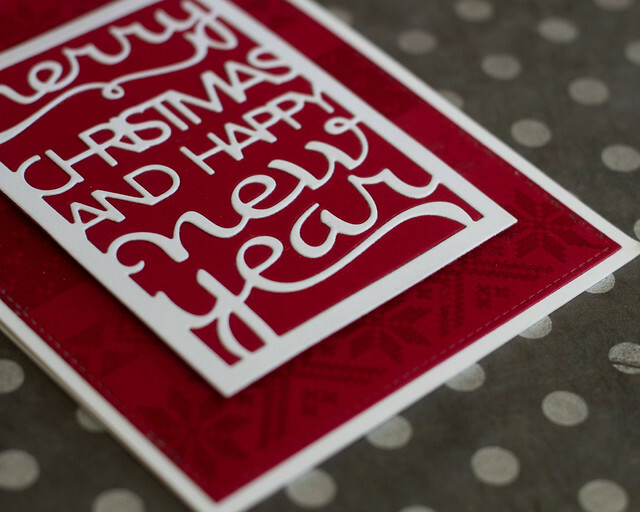 Then I rotated the card using my mark for reference and, after removing the middle wide stamp, I stamped and embossed again. If you wanted to make several cards, you could just clean that middle stamp and just re-ink the top two stamps. Then I ran that background panel through my Big Kick die cut machine with a stitched border and adhered it to my card base. I attached the text block with craft foam. For the second card, I die cut the text block with just a single layer of card stock. 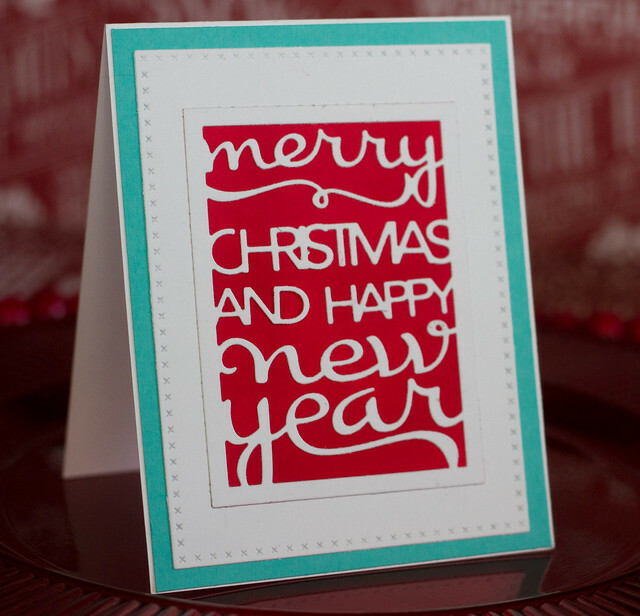 Then I took the frame left behind from removing the die cut and positioned it over another piece of white card stock of the same size and ink blended a background using Festive Berries Distress Ink. Then, leaving the frame in place, I positioned and adhered the text block over the ink blended portion. Having that frame in place really helped get that just right, let me tell you! I ran the panel through the Big Kick with a cross-stitch border die and then layered it on some aqua card stock. Because raqua. Raqua is my favorite, go-to, most awesome color combination, especially at Christmas. I haven’t actually settled on a design for this year’s Christmas cards, partly because I haven’t convinced myself to send my paper babies out into the world. But these are on the shortlist. Or maybe everyone will get a different card. Or maybe no one will get any cards.